Hungry but unwilling to shell out big bucks for popcorn? Don't. In a move that would surely be welcomed by movie-goers across Maharashtra, the state government announced on Friday that outside food - including home-cooked items - would now be permitted inside multiplexes here. Maharashtra Food Supplies Minister Ravindra Chavan announced the decision during the ongoing assembly session in Nagpur and said that cinema halls, theatres and multiplexes can now not prohibit eatables from outside inside their venues. He further said that action can be taken against employees of these establishments if anyone is stopped from carrying their food in. In a quick sequel to his statement on outside food, Chavan also stated that dual pricing of products available both inside and outside of movie halls won't be allowed. Zee News had been the first to start a campaign against charging beyond MRP and dual pricing. The two decisions have received an overwhelmingly positive response from social media users, some of whom say that already high ticket prices warranted at least food and beverages inside movie halls being sold at MRP. That they can carry their own food and drinks is an added bonus. 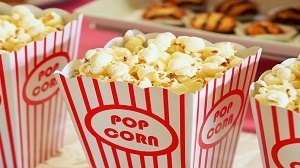 And while popcorn may remain the firm favourite of cinema-goers, the all-time favourite movie snack can now be bought from anywhere and enjoyed in front of the big screen.